Visit the B9Creator site again if you haven’t recently, it’s significantly updated, including a series of educational videos. Explore every page and link to get the most value. 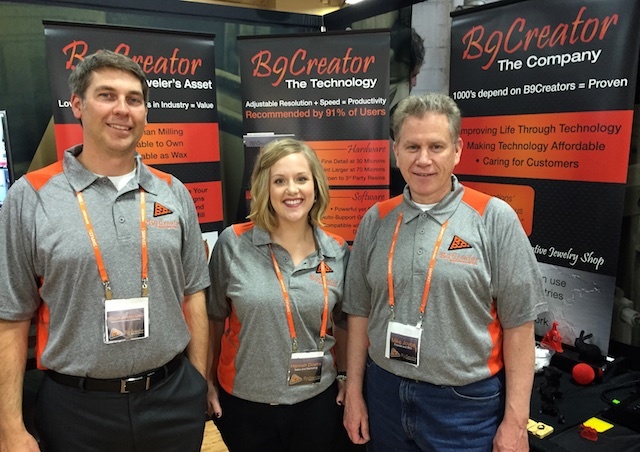 ZLab3d staff visited the crew at the B9Creator stall B6468 at JCK Las Vegas 2015. Pictured during a rare quiet moment at the stall are Shon, Hannah, and Mike (Scott was busy with a customer). We’ve started a page to help you cast B9Creations resin prints. Check back to the page occasionally as we’ll be updating it. Please register for the B9Creator Forums and contribute your results. Thanks!